Cycle tramps first blog entry! As I write this, it’s exactly 9 months until the start of our trip. 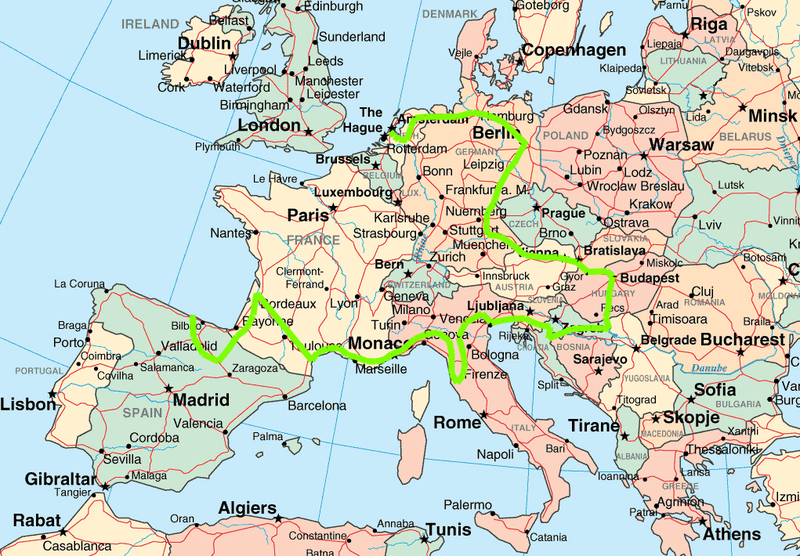 The epiphany moment- when our genius idea to cycle Europe was born- was only 2 months ago. It doesn’t seem like a long time to plan such a massive excursion, particularly considering that between us we have zero experience of long distance cycling. Anyway, I figure if 9 months is enough time for a mother to build a small person in her belly, prepare for its arrival in the world and the inevitable upheaval of the lives of everyone involved, it’s surely enough time for us to mould our little cycle baby into something resembling a proper plan?? It was with this sunny optimism that we booked our ferry last week. We depart from Portsmouth on the 18th June 2013 and we’re so excited I think we might actually pop. It hasn’t escaped our attention that there are far more sensible ways to do this trip (and I’m not just talking about the fact that we’re planning to do it by bicycle). For instance, we’re probably going to be doing the most sourtherly part of our trip during the hottest of the summer months, which isn’t ideal. But we really really want to be in Haro in Rioja (our favourite wine) at the end of June for the annual wine fight (yes, I said wine fight) and then in Pamplona for the running of the bulls. Right from the outset we knew we wanted to start our journey in northern Spain to coincide with these most bonkers of Spanish festivals. After all, the whole point of this trip is to travel and experience the joys of Europe, and we don’t want it to become more about the practicalities of cycling and daily mileage stats than the actual tramping itself. The rest of the route just sort of evolved over numerous evenings spent scheming and plotting our little adventure. We’ve started trying to piece together routes for sections of our journey and, although we in no way planned the journey around cycle routes, we are hoping to follow Eurovelo routes for most of it. The lack of proper mapping of the Eurovelo routes is a tad annoying – but more on that later! That’s about as far as our plans go at the moment. Oh, we’ve also read a couple of books to inspire us – Good Vibrations: Crossing Europe on a Bike Called Reggie and The Man Who Cycled The World, picked our tent, started saving and started building our bikes! You can find out more about our budget, bikes and equipment here.